We are holding a concert to help raise funds for our trip to represent Scotland at the National Championships that take place in Cheltenham in September. The concert takes place in Fisons on Friday 21st August starting at 7:30pm. 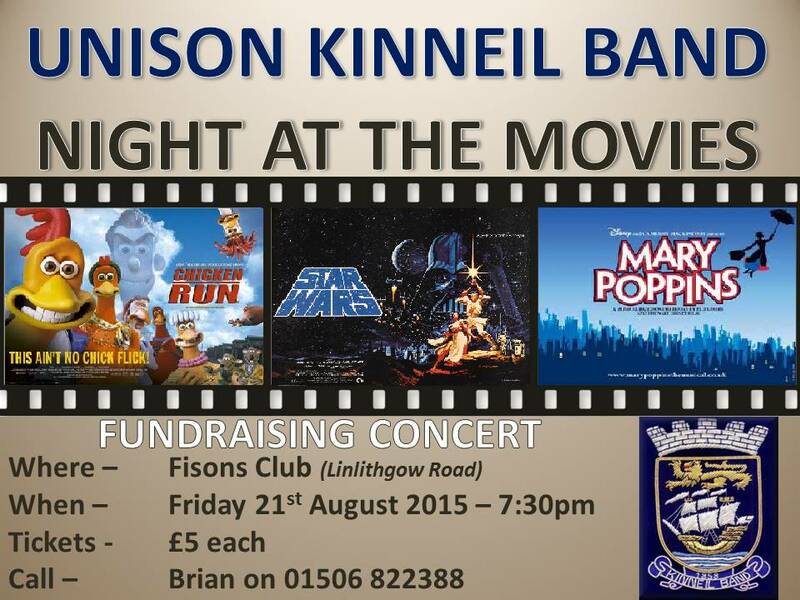 We are having a movie theme for the concert with popcorn and hotdogs available and tickets will cost only £5! 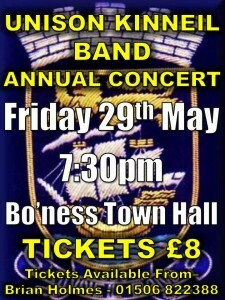 Please come along and support the band! 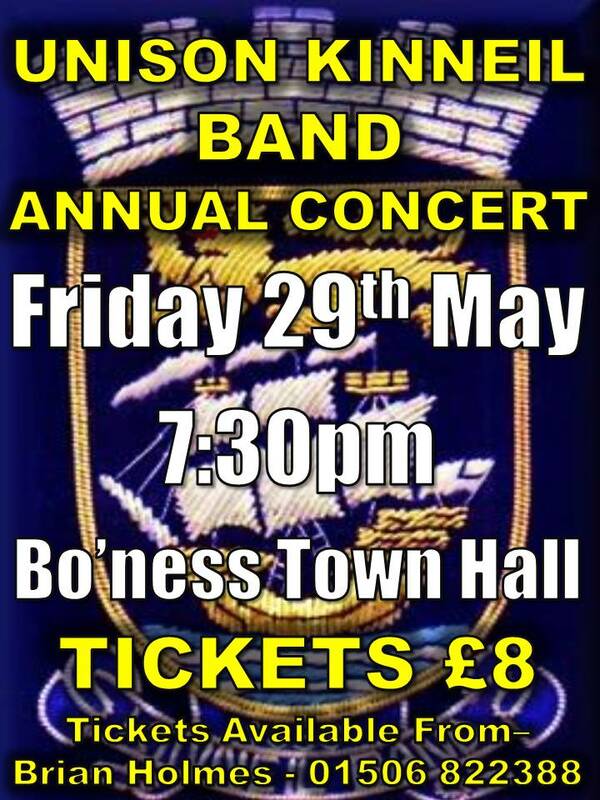 Tickets are now available for the UNISON Kinneil Band Annual Concert which is being held on Friday 29th May at 7:30pm. The 2015 concert that is being held in Bo’ness Town Hall is kindly being sponsored by local Funeral Directors – C.W. Anderson and Sons. 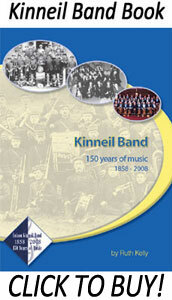 The concert will also feature the thriving Kinneil Youth Band who will be making their sixth appearance at the event. This jam-packed evening of music making promises something for everyone of any age! 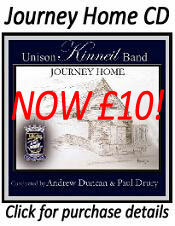 UNISON Kinneil Band have had an incredibly successful few years under the baton of Musical Direction Craig Anderson, back in March the band secured promotion back into the elite Championship Section of Scottish Banding after gaining 2nd Place in the 1st Section Scottish Championships. This result also ensures that UNISON Kinneil Band have gained a qualifying place to represent Scotland at the 2015 National Finals held in Cheltenham in September for the third year running! Tickets priced at only £8 are now sale now by calling Brian Holmes on 01506 822388. UNISON Kinneil Band is delighted to announce we secured second placed in the First Section Scottish Championships that were held in Perth Concert Hall on Saturday 15th March. Performing the set test piece for the championships ‘A London Overture’ by Philip Sparke where Kinneil pre-drew a favourable number 7 from of a field of 10 evenly matched bands. On the day the band delivered a delightful musical interpretation of this demanding set work. Adjudicators Leigh Baker and Mark Wilkinson thrilled the Kinneil contingent by firstly awarding our Principal Cornet player Lauren Robb with the Best Instrumentalist Award, then secondly announcing our Second place finish in the Championships. The result rewards the band with another visit to Cheltenham for the honour to represent Scotland at the National Finals for the third year running as well promotion to the Scottish Championship Section for 2016. The band are also delighted to be working so closely with an exceptionally musical, dedicated and hardworking Musical Director – Craig Anderson who has taken us another massive step forward in our rebuilding project. The band is holding its AGM this Thursday 29th January in the Bandhall. The evening will begin at 7:30pm. The formal business should take approximately one hour followed by an informal session focusing on future projects for the organisation. Everyone is welcome to come along on the night.